Some cars have that extra special reason to love them. Their driving experience is special and hugely rewarding, and for the driving enthusiast you know where your happy place is. 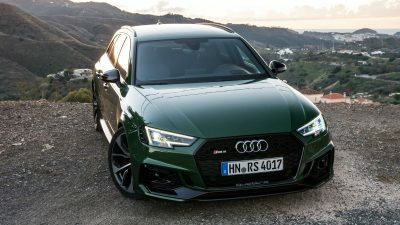 Audi’s 2019 RS4 is one of those cars that packs supercar performance with the practicality of an Avant. Audi’s iconic performance specialist has long challenged conventional thinking and the new RS 4 Avant continues that tradition of packing huge power into a mid-size station wagon; and the result is breath-taking! With a 2.9-litre V6 biturbo engine producing 331 kW and 600 Nm, the new RS4 rattles its competitors. Your sprint from 0-100 km/h takes just 4.1 seconds, while the quattro AWD has the corners and rivals wrapped up, then hit the straight and the 8-speed tiptronic gearbox connects the 600 Nm of torque to the road, keeping the flow of 600 Nm totally ripping the tar from as low as 1900 rpm – all the way to 5000 rpm. Approach the next corner, feel the brakes bite powerfully and smoothly and the entertainment continues to accelerate down the next straight leaving the other sport wagons quickly behind. Yes, the new RS4 wagon is immensely fast but you’ll still find the new Audi RS4 a relatively frugal companion when considering the formidable performance that lies beneath. Audi claim the RS4 is good for an average fuel consumption of around 9 litres/100 km. Styling has taken an even more streamlined look with some really cool sophisticated features. The distinctive RS styling cues abound, from the iconic honeycomb grille and large air inlets on the aggressive front end, to the roof-edge spoiler and oval tailpipes at the rear. The big wheel arches don’t just look cool but they speak to the car’s tremendous performance. Really cool dynamic indicators on the optional Audi Matrix LED headlights show the turning direction clearly and unequivocally to those around. DRLs add to the distinctive look of the spunky RS 4 Avant, but add an important safety feature. The Matt aluminium look styling package has a matt aluminium look that highlights around the Audi Singleframe, the trim strips on the side windows and the bumper (front and rear), exterior mirrors and roof rails in. This package has a carbon engine compartment cover, a special convenience key, full keyless entry and a start electric rear tailgate with programmable opening height and gesture control. The car’s exterior mirrors are heated, folding and auto dimming with memory. You get a kerb-side function on the passenger side, while the privacy glass – dark tinted rear and rear side windows – look exceptionally cool. An electric sunroof, LED headlights including LED daytime running lights, all-weather lights, turning lights, motorway light function and LED rear lights with dynamic indicators, a headlight washer system, and special RS specific darkened trim elements that include the Technik package with an RS sport exhaust system with gloss black oval tailpipes. Sitting on some really nice 20-inch alloys as standard keep you the eye-catching sportwagon doing the rounds. An optional 20-inch alloy wheels option has a 5-twin-spoke-edge design. I personally like the Brake callipers painted gloss red with an RS logo, but there is an optional style of the Ceramic brakes at the front with brake callipers painted in gloss anthracite grey. Feel the love in the new RS4 interior. The race-inspired cabin is finished with the highest quality materials and features – as you would expect from Audi. Class leading infotainment systems connect you to premium technology. The sports seats offer a massage function for those in the front and are finished in fine Nappa leather with a distinctive honeycomb stitching and imprinted RS logos. 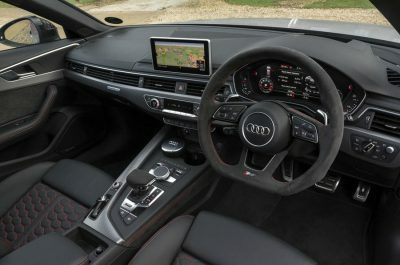 The Audi virtual cockpit with its 12.3 inch display features a bespoke RS mode that houses a central tachometer as well as G-forces and lap times. High definition graphics are about as good as you’ll get anywhere in this class of car. 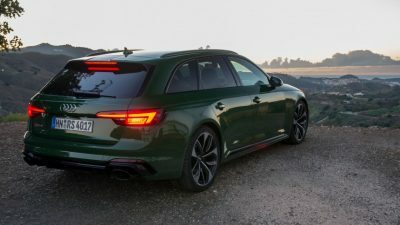 A brand new 2019 Audi R S4 wagon has all the best safety features, so things like 8 airbags, attention assist that provides a warning alert tone and visual signal if the system evaluates that the driver’s attention may be lapsing, Audi pre-sense city with Autonomous Emergency Braking (AEB) and pedestrian detection2, Audi pre-sense rear – helps to mitigate rear end collisions within system limits through a series of measures including flashing the hazard lights at high frequency to warn surrounding traffic, Electronic Stabilisation Control (ESC) with electronic wheel-selective torque control, ABS, ASR, EDL and Brake Assist Electromechanical parking brake, a first aid kit, warning triangle and high visibility vests, Hold assist – holds the vehicle on gradients indefinitely to enable smooth driving, seat belt reminders for all passengers, and a tyre pressure monitor system with individual tyre pressure and temperature displays. Of course, the road holding and handling are razor sharp, while the brakes are phenomenal. The inside of the new Audi RS4 is a wonderful place to spend time, and with the cabin incorporating some cool features you’re not going to want to get out. Features like RS sport front seats with integrated front head restraints and manually extendable thigh support, electric seats for driver and front passenger including pneumatic adjustment of the seat side bolsters, electric lumbar support, massage functions and memory for driver’s seat, Fine Nappa leather upholstery with a honeycomb pattern contrasting stitching on the seat backs keep the cabin very refined and stylish. An Alcantara extended upholstery package adds this trim to the lower part of centre console, door armrests and door pull handles in man-made leather. Heated front seats, heated front and outer rear seats, ventilated front sport seats in Milano leather. Other finishes look nice depending on your own preferences; so an aluminium trim, anthracite inlays in aluminium race, or inlays in a piano finish look really smart. Even oak, black, natural grey and carbon inlays are available. Being a wagon/Avant, the RS 4 Avant can accomodate passengers and luggage comfortably. 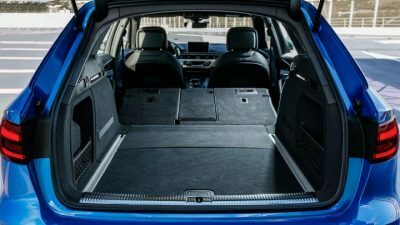 The rear seats fold flat for extra cargo space. Three-zone deluxe automatic air conditioning, a ventilated glove compartment, a anti-theft alarm system, an auto dimming interior mirror, a special 30 colour ambient lighting package, light and rain sensors, cup holder in the rear centre armrest, a storage net and hooks for the luggage compartment make living with the RS4 a nice proposition. Audi connect includes in car Wi-Fi hotspot and Google services, Audi music interface with 2 USB inputs, wireless charging for mobile phones that support the “Qi” standard, Bluetooth connectivity, Apple or Android device connection, MMI interface, a fully digital configurable instrument cluster with a 12.3 inch high resolution colour display, a Bang & Olufsen 3D Sound System, 19 speakers including tweeters in the upper part of the A pillars, a 16-channel amplifier, music streaming DAB+, and a Head up display – in colour with speed, navigation and assistance information. All of these features are really classy. The MMI navigation has a nice clear touchscreen with integrated voice control with a natural language voice input. The new Audi RS4 is a well aided car. You get a 360 degree camera, adaptive cruise control with Stop-and-Go including traffic jam assist and distance indicator, Audi active lane assist, an Audi parking system, Audi pre-sense front – provides extended collision mitigation up to 250 km/h, Audi side assist – warns vehicles in the blind spot as well as those approaching rapidly from the side, Collision avoidance assist, Cross traffic assist, Dynamic steering, Park assist, Predictive efficiency assist – provides targeted control of the engine overrun and coasting phases, and Turn assist monitors oncoming traffic when turning right at low speeds. Quite a car and definitely the performance wagon by choice. For any more information on the 2019 Audi RS 4 or, for that matter, any other new car, contact one of our friendly consultants on 1300 303 181. If you’d like some fleet discount pricing (yes even for private buyers! ), we can submit vehicle quote requests out to our national network of Audi dealers and come back with pricing within 24 hours. Private Fleet – car buying made easy!